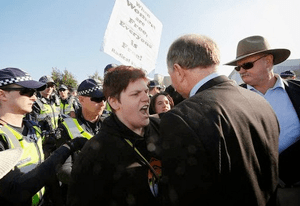 One protester managed to sneak in as a registered guest, storming the stage and pouring fake blood over herself in front of NSW MP, the Reverend Fred Nile and his wife. “We don’t want your backyard abortions,” she yelled, before being marched out. Guests at the event were visibly rattled by the breach and turned to prayer as the woman was ushered outside. But despite ongoing protests at the gate throughout the day, the rest of the conference was incident free. Controversial American breast cancer doctor Angela Lafranchi was one of the headline acts, pushing her research suggesting a link between abortion and breast cancer. Reverend Nile, leader of the NSW Christian Democrats, called for more Christians to get involved in politics. And Paul Hanrahan, the executive director of Family Life International Australia, used his speech to suggest abortion was worse than terrorism in Syria. “Many people lately have been upset at the terrible atrocities being committed in the name of religion in Iraq and Syria and other places. Terrorists and terrorists’ kids holding severed heads is certainly gruesome. Answer me this: how is it worse?” he asked.